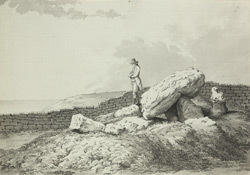 This view in ink shows the Heelstone or Hell Stone, on Ridge Hill near Portesham in Dorset. It is a cromlech or dolmen: a type of Druidical temple common in the area. It consists of nine upright stones, with a horizontal stone 11 feet in length, with four other standing monoliths.